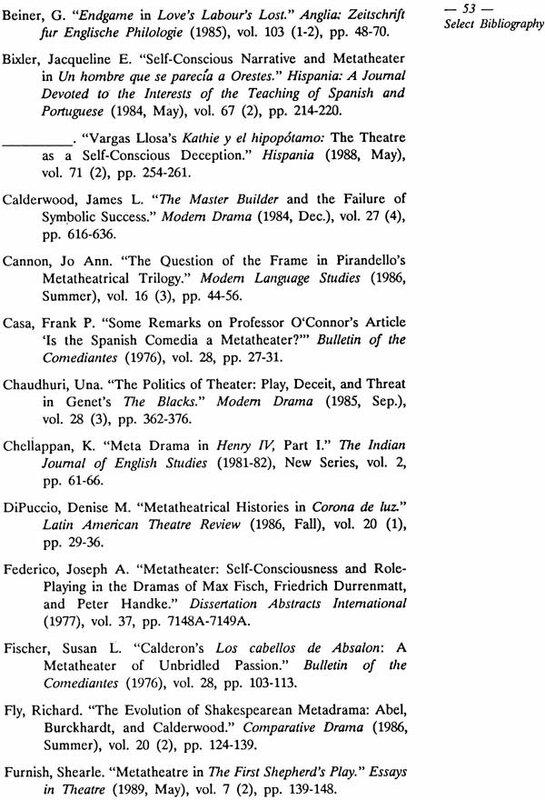 In 1963, Lionel Abel's book, Metatheatre: A New of Dramatic Form, was published. 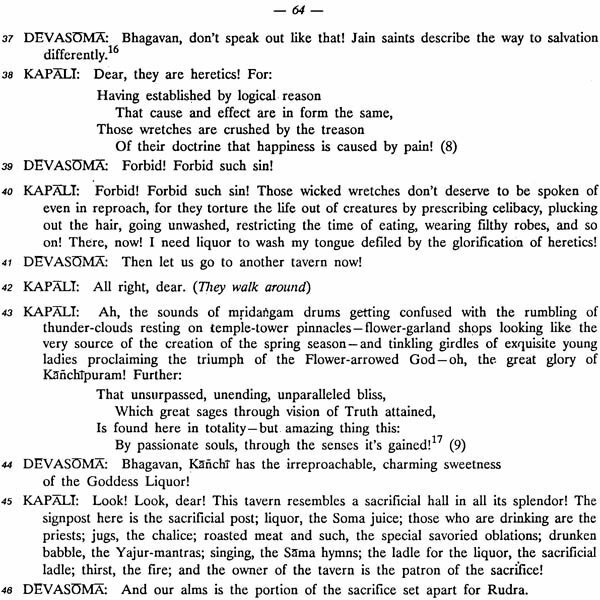 The basic idea of metatheater is that of multiple 'layers' of illusion. 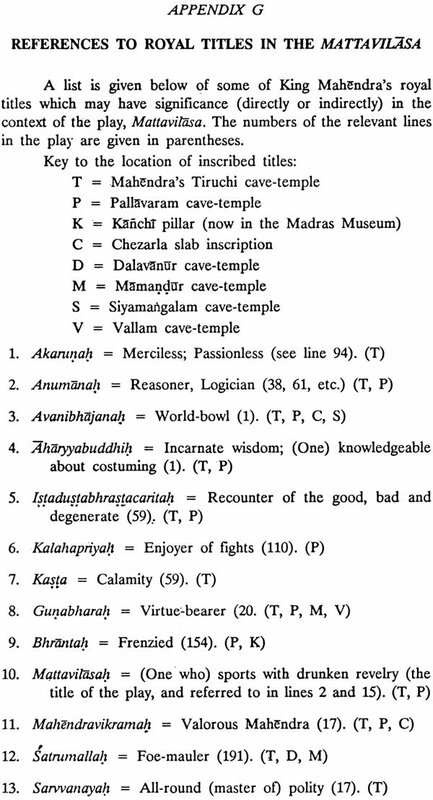 The prefix 'meta-', here, suggets 'beyond', 'above', or 'within'. 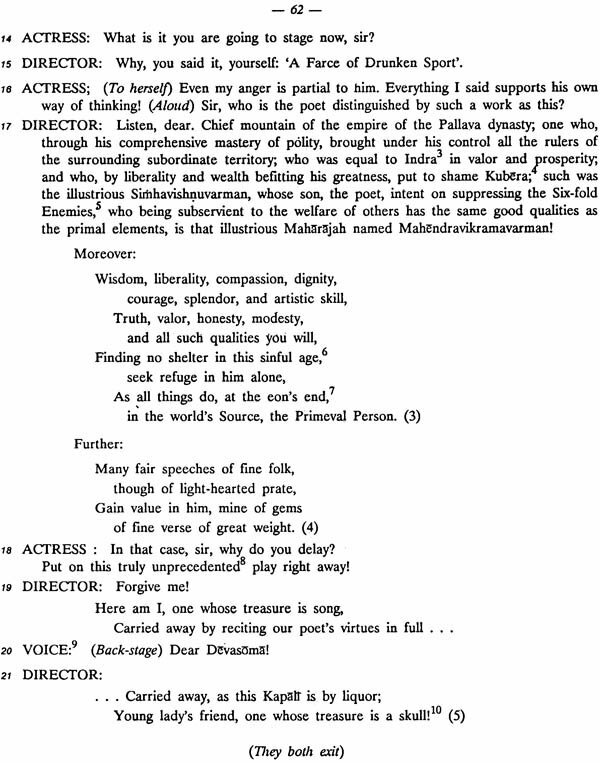 Metatheater, in one of its senses, can be viewed as one make-believe (dramatic) world superimposed upon another make-believe (dramatic) world. 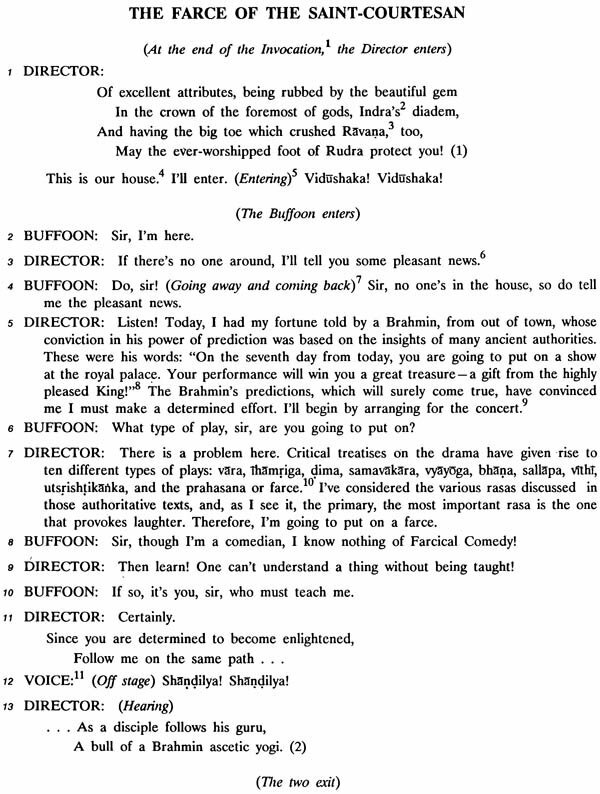 Or as one dramatic world framed within another dramatic world. 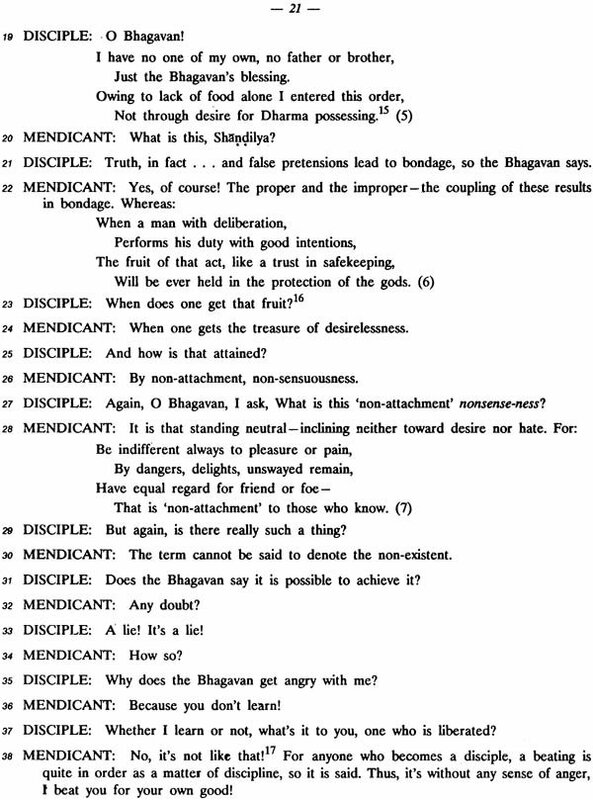 The most easily relationship is the 'play-within-the-play'. 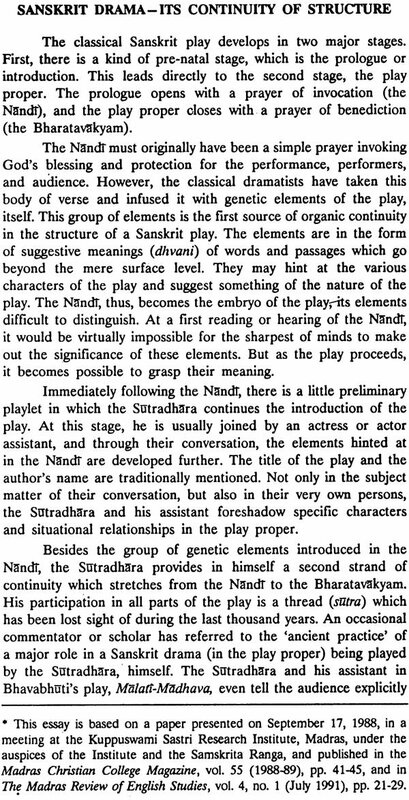 The first five essays illustrate how profoundly a knowledge of the metadramatic structure of Sanskrit plays will affect the way in which they are to be understood and translated. 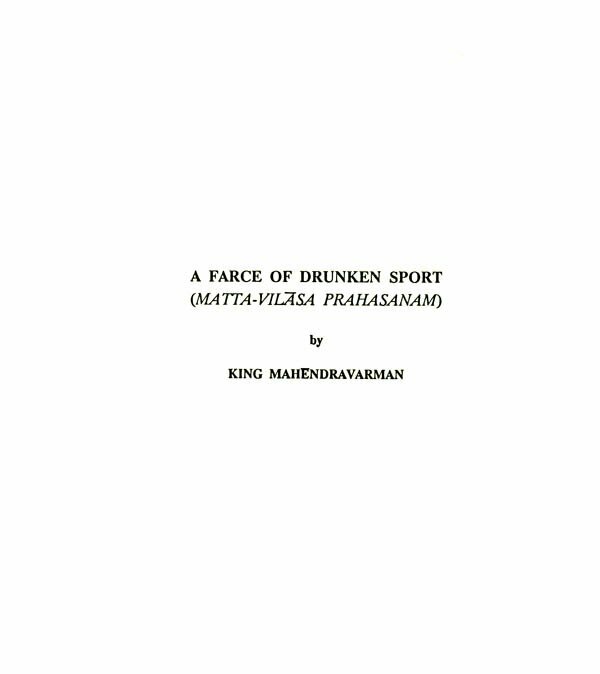 Part two of this book presents the text and translation of, and commentary on, two Sanskrit farces which were written in the seventh century A.D. by the South Indian king, Mahendravarman. 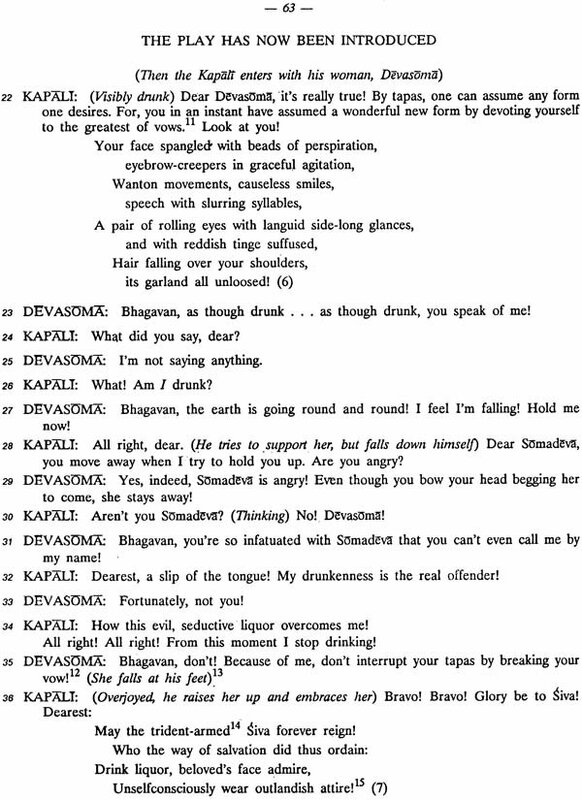 These two plays superbly illustrate the multi-dimensional splendor of 'metatheater' in Sanskrit drama. 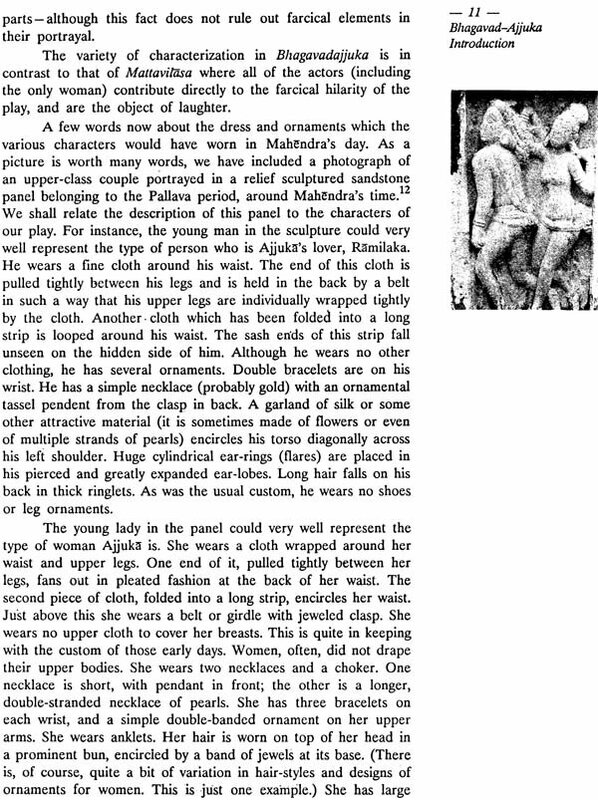 Michael Lockwood and Vishnu Bhat are both faculty members of Madras Christian College, Tambaram. Dr. Lockwood (Dept. 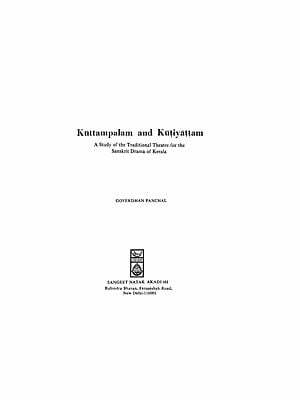 of Philosophy) has written a number of articles on the Pallavas, and has published two books which deal with the art, philosophy and history of the Pallavas: Mamallapuram and thePallavas and Mahabalipuram Studies (co-authored by Dr. Gift Siromoney and Dr. P. Dayanandan). 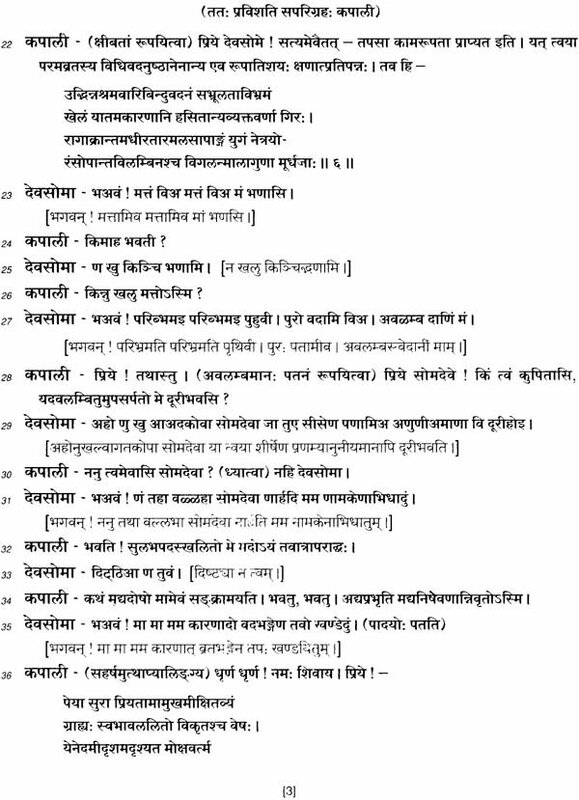 Dr. Vishnu Bhat (Dept. 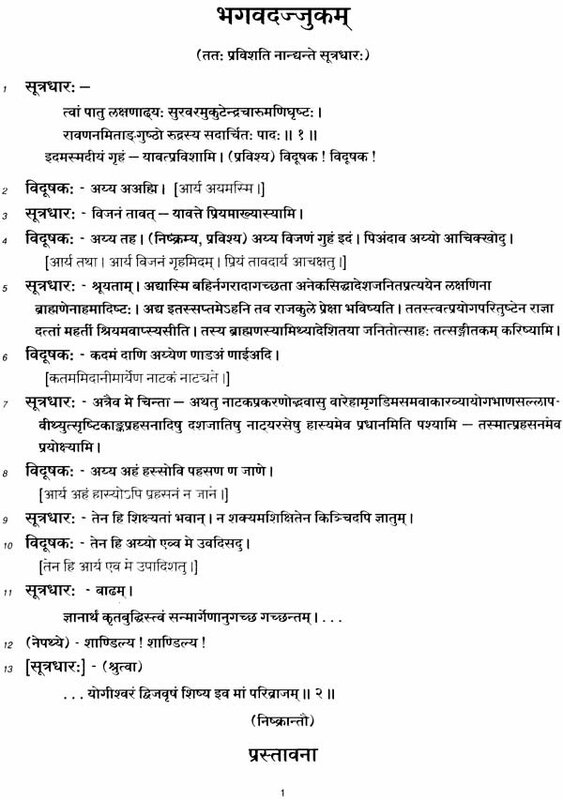 of English) had much of his early education in a Sanskrit school before receiving his higher degrees in the field of English literature and language. 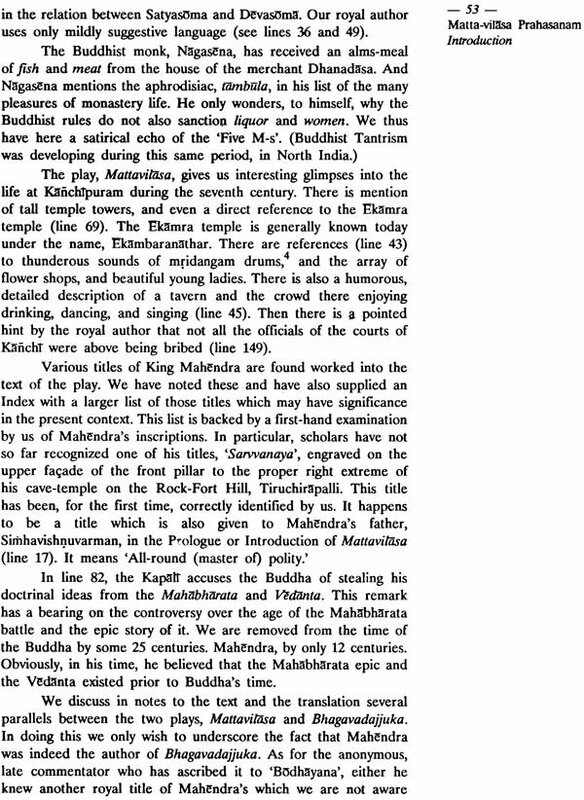 He has collaborated previously with Dr. Lockwook in writing several articale on the inscriptions of the Pallavas. 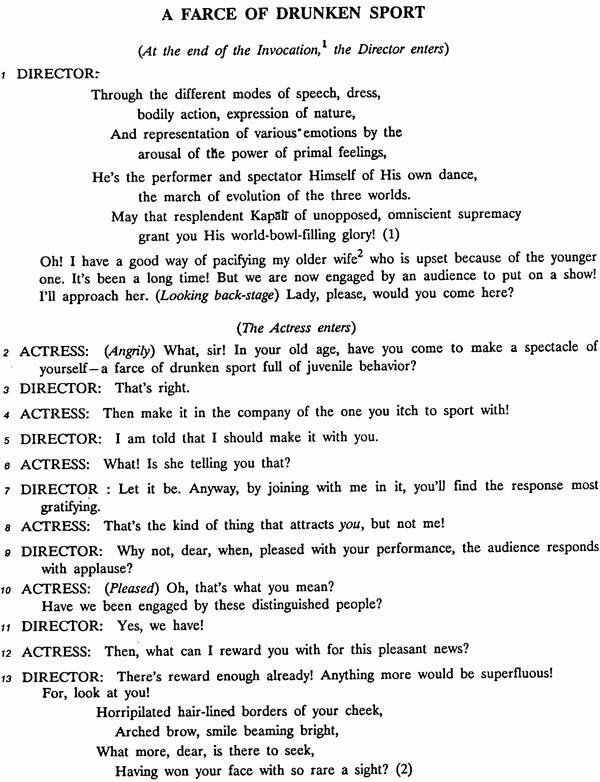 In 1963, Lionel Abel's book Metatheatre: A New View of Dramatic Form, was published. 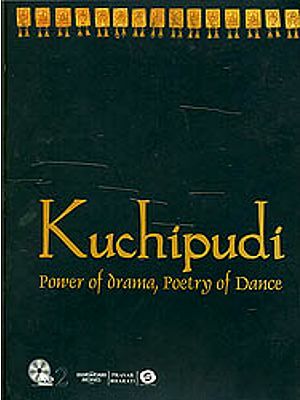 In this book Abel introduced a new term: 'Metatheatre'. 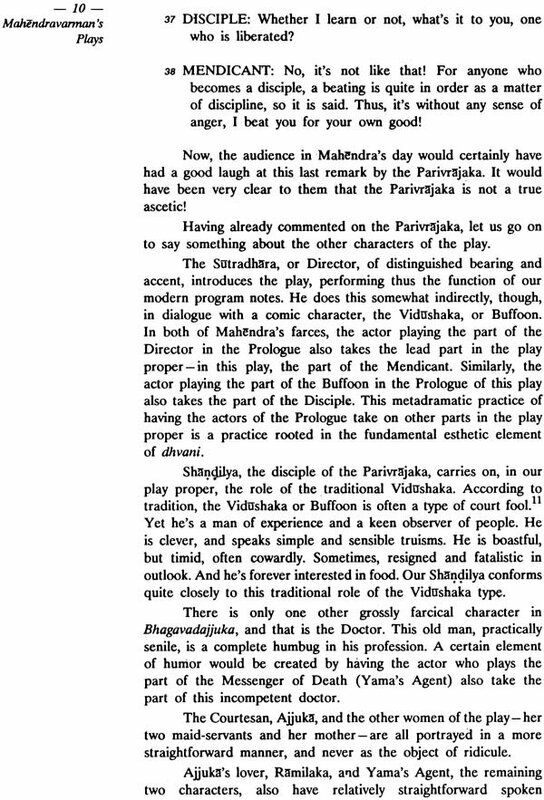 According to him, 'metatheatre' is the right term to describe the only form possible to the contemporary playwright who wishes to treat a subject gravely. 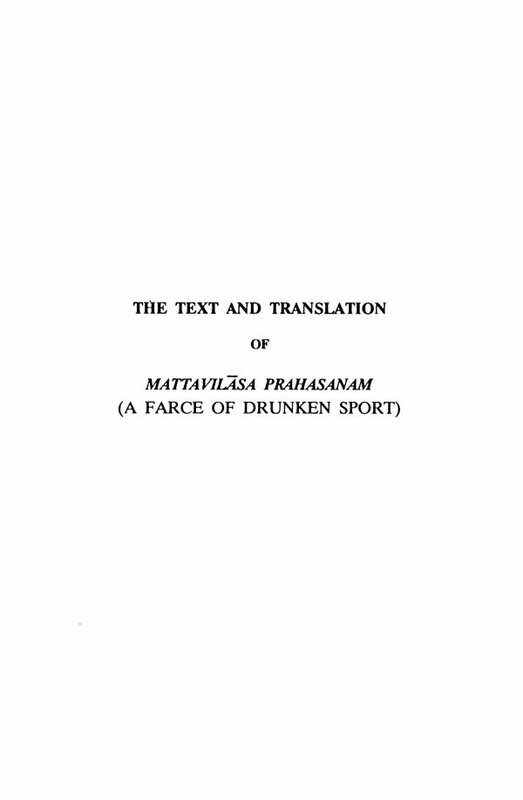 He held that tragedy, invented by the Greeks to describe pain and yet give pleasure, is unrealizable today. In the late Renaissance, a revolution occurred in human consciousness which made tragedy impossible. 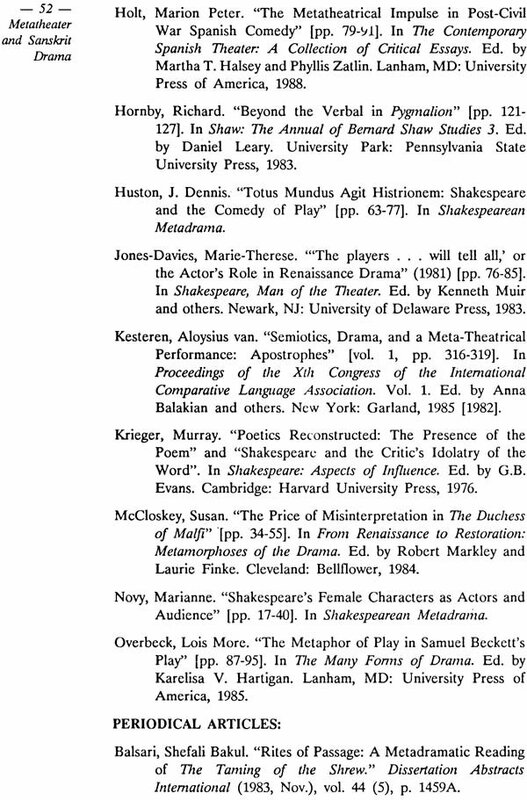 But playwrights such as Calderon and Shakespeare wrote 'serious' plays which were self-reflexive: the illusion that sustains the play worlds also sustains the world outside the plays - the so-called 'real world'. 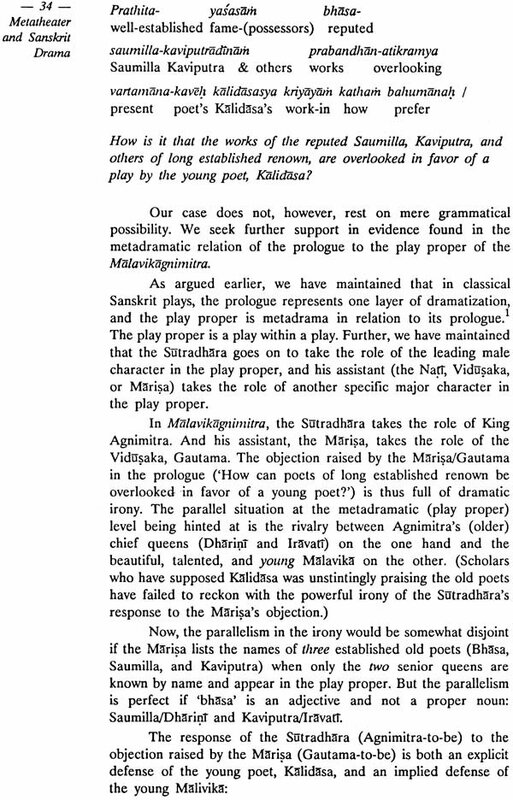 Abel's theory of metatheater is not a simple one, and it is, perhaps, better to look at a later analysis of this and related terms: 'metadrama', 'metaplay', etc. 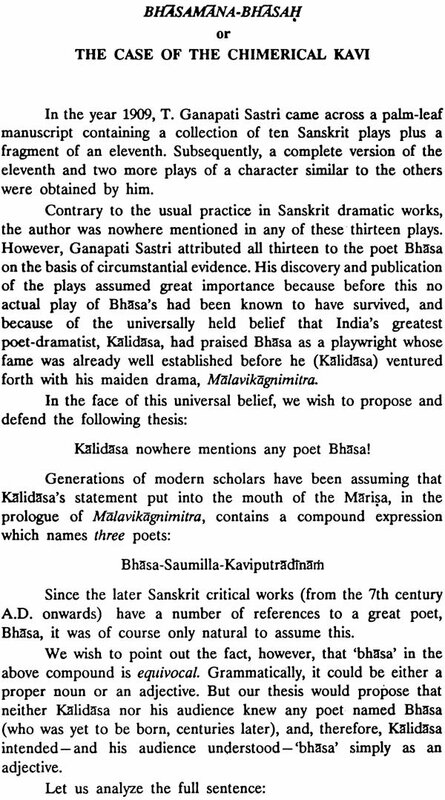 The question might be asked what relevance such a recent topic of literary criticism in the West would have to a study of ancient Sanskrit drama. 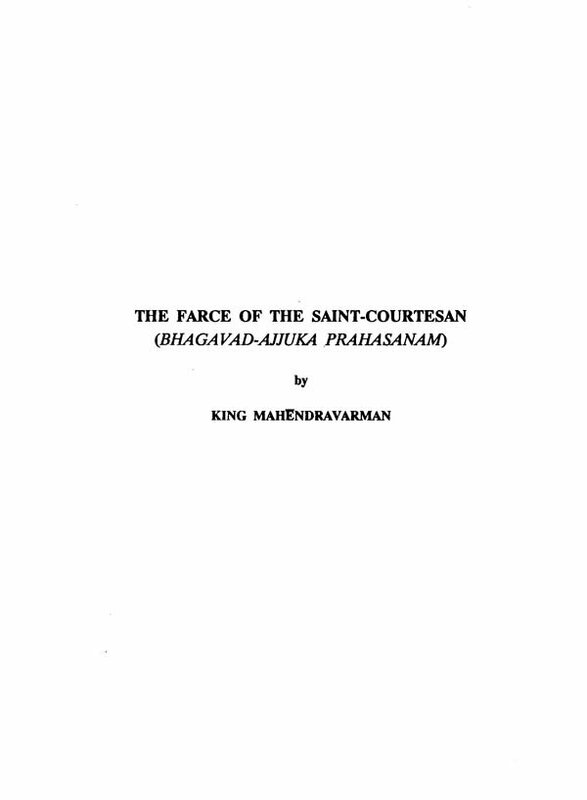 Each of the six essays in Part One of this book provides, we hope, an effective answer. 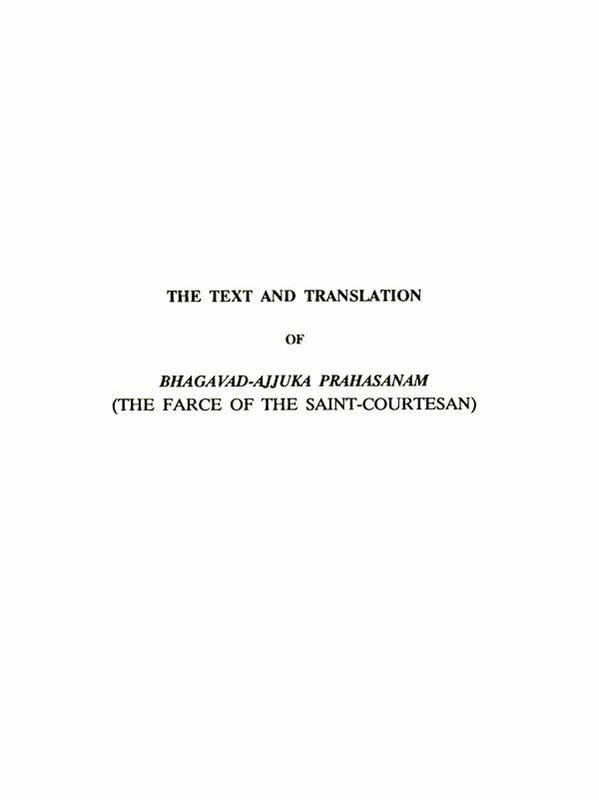 In our sixth essay, we translate the passage in the Abhinavabharati, where in Abhinavagupta comments upon the term 'natyayita. 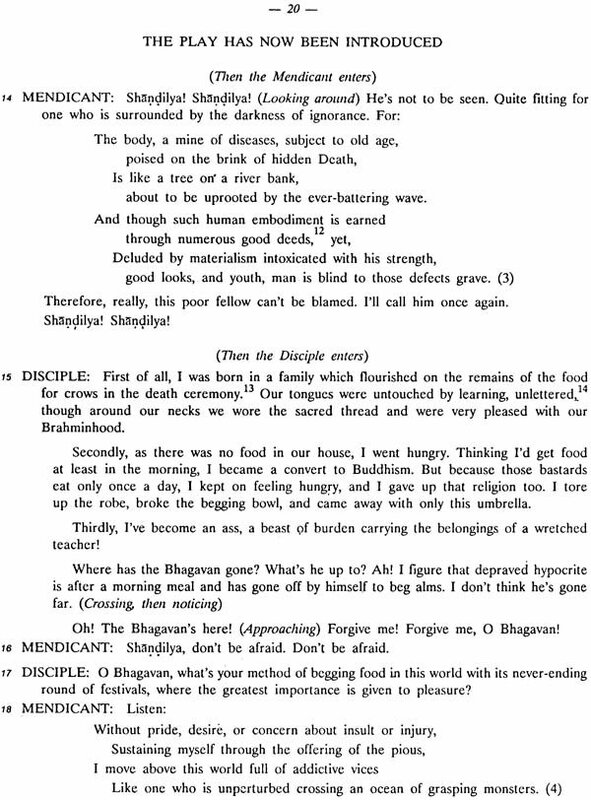 Remarkably, this ancient Sanskrit term is most appropriately translated by the freshly minted English word, 'metatheater'! 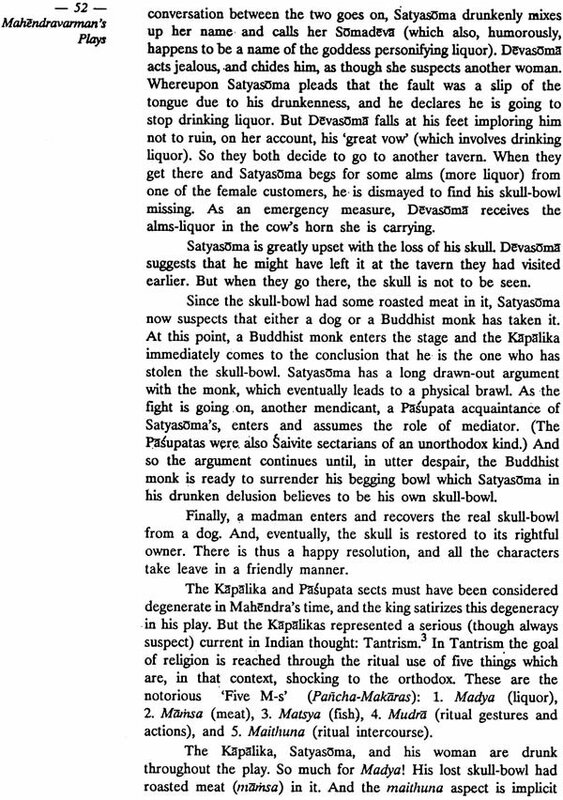 And it is through an understanding of this 30-year-old English term ('metatheater') that we are able to obtain a revealing insight into what Abhinava was saying one thousand years ago about ‘natyayita’, a term used in the Natya-Sastra, in the section on Sarira Abhinaya, and illustrated by Abhinava with a reference to Subandhu's play, Vasavadatta Natyadhara. 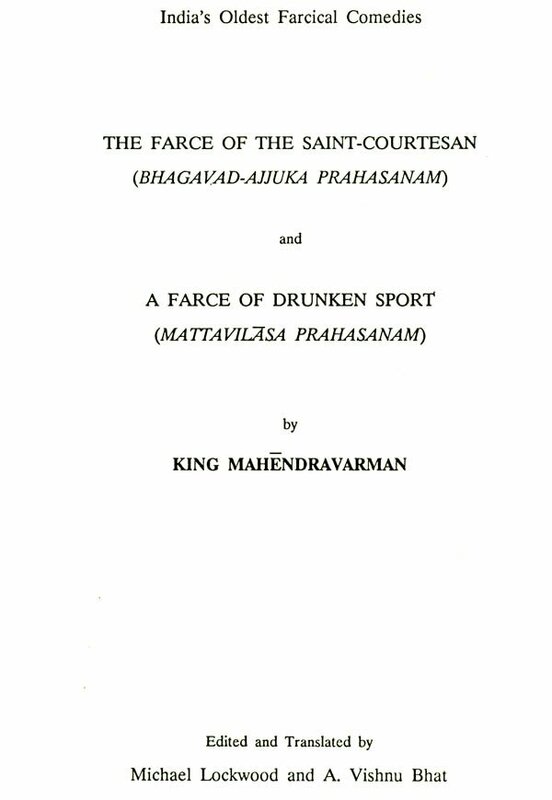 Part Two of this book presents the text and translation of, and our commentary on, two Sanskrit farces which were written in the seventh century A.D. by the South Indian king, Mahendravarman. 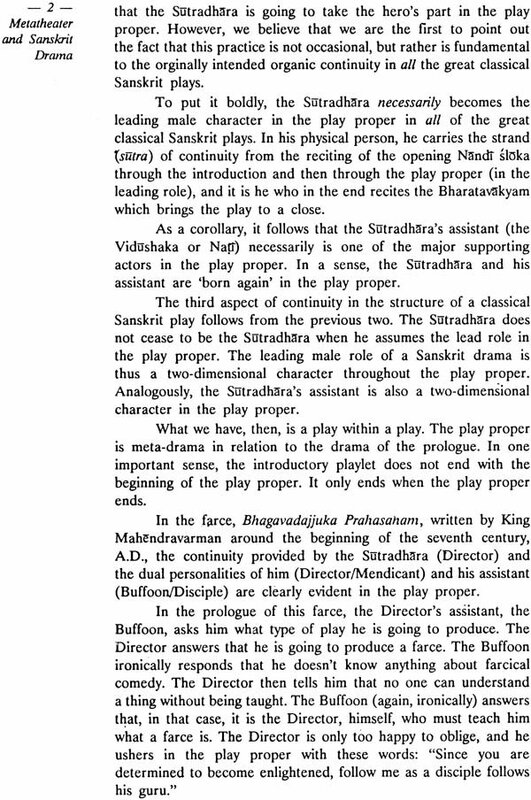 These two plays superbly illustrate the multi- dimensional splendor of 'metatheater' in Sanskrit drama.